SBSI vision sensors are designed specifically to enhance the engineering productivity of OEMs. The sensors feature fast and easy set-up, integrated lighting, and are EtherNet/IP enabled for networking with Rockwell control architectures. Festo introduced today the SBSI series of low-cost vision sensors for code reading and quality inspection. Every aspect of the SBSI vision sensor ̶ fast set-up, compact, rugged IP67 housing, built-in lighting, EtherNet/IP capability, and more ̶ was designed to make it easy for North American original equipment manufacturers (OEMs) to incorporate the power of vision sensing into their solutions. SBSI sensors can be ordered as components, parts of a sub-system ready for assembly, or incorporated into a plug and play module. The SBSI-B reads 1D and 2D codes. These code readers can be used to identify and track and trace products for production flow, logistics, and serialization. The SBSI-B can also read Direct Part Marking (DPM) codes, including both laser etched and dot-peened codes, and can check for the quality of a DPM code. The SBSI-B reads up to 10 codes per image. SBSI-B readers are ideal for automated solutions in the food and beverage, automotive, and electronics industries. Medical and laboratory equipment manufacturers can also utilize these cost effective readers for sample/vial barcode identification. The SBSI-Q for quality inspection can be used for completeness and presence sensing to ensure all relevant parts are mounted and/or accounted for. For example, the sensor can determine whether a blister pack of tablets is complete or a package label printed correctly. Position checking can verify if caps are correctly mounted or screws and holes are in the right position. Fill level control can ascertain that the correct amount of liquid, powder, or pills are in a bottle. The SBSI-Q can compare an object’s contour with taught-in reference contour, and can compare patterns and evaluate pixels within the search area by calculating contrast, brightness, or variations in gray scale. SBSI series optics offer a range of reading areas and working distances. Code reading models have enhanced depth of field to increase the area of focus. Built in lighting comes in white, red, or infrared. There are also a range of options for additional lighting, including ring lights and area lights. All additional lights are plug and play. 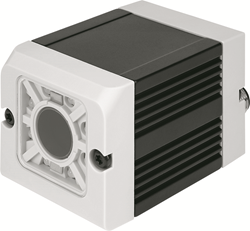 The SBSI housing is exceptionally small and rugged with an IP67 rating, which is ideal for automotive and food and beverage applications. All key functions, including processing, lighting, and optics, are integrated. There are status and I/O indications. Working distance is adjustable. SBSI sensors have two inputs and four outputs with two PNP/NPN switchable I/O. Users have many options for communications protocols, including Industrial Ethernet – EtherNet/IP, TCP/IP, FTP, SMB – digital I/O, and RS232/422 (code reader model only). SBSI software is intuitive to use with set-up only requiring three to four steps. For more information on the new vision sensor series, the SBSI from Festo, call 800-993-3786 and/or visit http://www.festo.com/us.